But where were the horses? What is a joey I hear you ask ........ if you are from Australia you will probably think that a joey is a baby kangaroo. The truth is that a joey is any marsupial baby. We have kangaroo, wallaby, possum and wombat joeys just to name a few. My name is Chris and I live just outside Canberra, which is the capital of Australia. I am a wildlife carer but I do specialize in Eastern Grey kangaroo and wallaby joeys. I am part of a group called Wildcare Queanbeyan and we rescue, rehabilitate and release native Australian wildlife. In the ten years that I have been a member of this group I have cared for over sixty of these little animals, many of which I have released on my property. You can see photographs of many of them, plus a bit more in my Photograph Galleries. As you can see, these little animals are extremely affectionate and bond closely with their carer. The two in this photograph (taken in 1996) are Carla (front) and Mippet (being cuddled), hidden on my lap was Arnie. When they weigh ten kilograms (approximately 25 lbs.) they are considered ready for release. Since this photograph was taken I have cared for quite a few other joeys and most of them have now been successfully released. Several years ago I was fortunate enough to care for a little wombat joey who I named Shari and I have included a photograph of her here. She was the first wombat joey I'd cared for and I thoroughly enjoyed the experience because wombats are so completely differernt to my usual babies. Shari left me in April 1999 to go to another carer who prepared her for her release in October 1999. While I had her I had the joy of caring for a very loving little animal with a tremendous sense of humour. I released a swamp wallaby named Marco in January 1999 to join two little female "swampies" Cleo and Zoe which I released in February 1998. 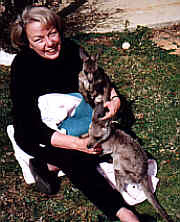 My first Red Neck Wallaby called Madam Rosie was released late in 1999. In 2000 I had an adorable Brushtail Possum called The Duchess. I got her when she was 81 grams and she weighed over 2 kilos when she was released. This photograph was taken several days before she was released. In 2001 I cared for an even smaller "brushie" who I called Vanity. She weighed a tiny 61 grams when she came to me and she was released in March 2002 when she weighed 2 kgs. 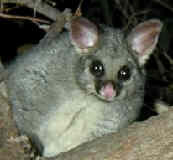 Brushtail possums are the most delightful bundles of fluffy grey fur imaginable. Jaws another Brushtail possum, I cared for was released after nearly 12 months in care, and despite the fact that his tail had to be amputated when he was a tiny joey, it seems that he is managing extremely well in the wild. 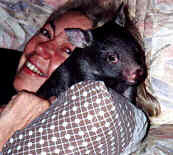 One of my little kangaroo joeys, Pam, came to me on 8 June 1997 as a "pinky" (so young she had not grown fur) and weighed 425 grams (less than one pound) when she came into my care. Her eyes were still closed and her ears were down. She was a very special little girl and has a very special place in my heart. Her story can be found on my Pinky Diary page. It has a very surprising postscript which involved a trip to the USA where I visited Baltimore to give a speech about raising kangaroo joeys. I then visited New York City, Indianapolis, Chicago and San Diego. Being born and raised in Australia I suppose it's not surprising that my tastes in music and poetry include Aussie favourites with "The Man from Snowy River" and "Clancy of the Overflow" at the top of the list of my favorite poems. As well as these two poems, I have also included other very typically Australian poetry. You will also find some pages of photographs of the Birdsville Races, Lightning Ridge (home of the beautiful black opals, which are not found anywhere else in the world), a holiday in Thailand and also Floriade. The latter is a floral festival held in Canberra every year. More recently I travelled through the Kimberley region which is in the remote far north western part of Australia. This is stunningly beautiful country and photographs do not do justice to the vast spaces and the many gorges which are to be found there. I discovered the Internet back in October 1995 and since then I have become as addicted as any of you reading this page. I have made some wonderful friends and I've had a steady stream of visitors from all over Australia as well as from the USA, Canada, Germany, Denmark, Italy, Turkey and New Zealand as a result of the Internet.